Where are your tours located? Our tours take place in Pangkalan Bun, Central Kalimantan (otherwise known as Borneo). We trek through Tanjung Puting National Park. Can I customise the tour at all? Absolutely, in fact we encourage it! The beauty of our private tours is that you can tailor them to your own needs. There may be additional costs involved depending on your requirements, but we will update you if there is any increase. If you would like to be challenged, we can make the trek more strenuous. If you would like to spend more time on the klotok, we can make that happen too. Just let us know your ideas and we will do our best to make them happen! What are the visa requirements and fees? Your visa will last for 30 days upon arriving into Indonesia. There are currently no fees for Indonesia on arrival or departure at this moment. Do I have to be a certain level of fitness? Orangutan Trekking Tours are suited to people of all ages, who are in reasonably good health. If you have a health condition that might inhibit your ability to do a trek with us, please let us know and we will do our best to accommodate you. You have two options when it comes to your sleeping arrangements. You can either sleep on the Klotock or stay at the Eco Lodge. Some guests prefer sleeping at Rimba Orangutan Eco Lodge for a few more subtle luxuries. If you choose to stay at the Rimba Lodge, there is a slight increase in price for the tour. Pricing is dependent on the season. Which airport do i need to arrive at? Our tours take place in Pangkalan Bun, Central Kalimantan (otherwise known as Borneo). Once you arrive at Pangkalan Bun Airport, we will pick you up and drive to Kumai (around a 20 minute drive) and then board a Klotock, making our way closer to the Orangutans in the Tanjun Putin National Park. Can you pick me up from my hotel if I'm staying nearby? Sure. Just email us with the details of your stay and we will be able to organise pickup. When is the best season to visit Borneo? 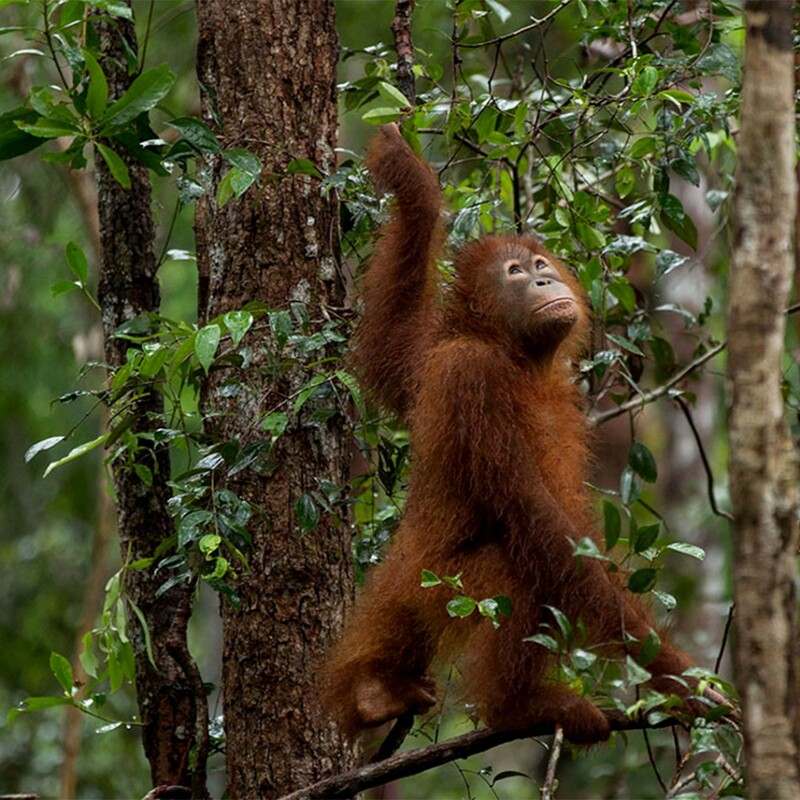 Borneo can be enjoyed all year round, but our high season is from May through to September. November until February is considered the wet season and while we still trek during this time, there is a higher chance of rain. Once you are trekking, you will need little to no spending money. If you would like to make a donation to the Green Team, you can do so here. There is also a local primary school located in the national park, where your contribution of stationery or sports gear is much appreciated. Am I allowed to give the orangutans food or a cuddle? No. But that’s how you know we are an eco friendly orangutan tour – we respect the orangutans and their habitat. Orangutans raised in the wild are typically shy and territorial, so we try to observe them without disturbing their natural way of life. Walking shoes: hiking boots are ideal, but sturdy sand shoes will work as well. Thongs for in between hiking and relaxing on the klotok. A high DEET mosquito repellent. It is the jungle after all! We have some, but bring your own just in case. Will I only see orangutans? Can I donate to Orangutan Trekking Tours? Your donation helps the Green Team fulfil their dream of buying back land and protecting it from Palm Oil farming. You can donate here. You can also bring notebooks, stationery and toys for the village school to use in their classes! We specialise in private guided tours of the jungle. This means the tour will be your group, your Green Team member and possibly another small group of trekkers. However, we occasionally organise larger group tours – if you’re interested, we will let you know of any upcoming group tour dates and sign you up. We recommend that you book at least a month in advance, so we can make sure everything is in place. However, we will try our best to book you in short notice as well, just ask! Sadly, I can't go anymore. Can I get a refund? Please refer to our Terms & Conditions in this situation. We provide you with breakfast, lunch, dinner, snacks and water throughout the day. Lots of laughs, learning and memories! If you would like to book a trek, please fill out this form and we will be in touch shortly. What will I eat on the tour? Lots of delicious and nutritious food, prepared fresh daily. We can cater to your dietary requirements – just let us know in the booking process. English speaking guide and own chef. Meals as indicated , meals serve on the boat. Admission fee and park entrance permit. Mineral water, tea, coffee, and snacks on the boat. Please contact with us via the form on the left. We will endeavour to get back to your enquiry as soon as possible.